Welcome to part two of using PPC strategies to improve your Tinder profile! Last time, we started off with determining your unique value proposition (UVP). Knowing your UVP will allow you to show off what makes you different from everyone else! Today we’re going to focus on settings. When we set up a PPC campaign for a client, we take many factors into consideration. What locations do they serve? What are their business hours? Questions like these help us to dial in their campaign so we are making the most of their Adwords dollars. Similar to Adwords, you can choose to show your Tinder profile to those within a certain radius of your location. Just like a location based business might want to show ads to potential customers located nearby, you might only want to show to people within a specific age range and location radius. 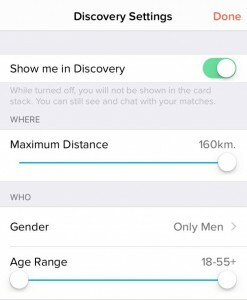 Note: Tinder allows you to search as far away as 160 km and in the 18 to 55+ age range. Do you want to show your profile to a broader or smaller, but targeted pool of users? If your goal is to get a date, the chances of converting the match who lives 50 km away from you and outside of the city are typically much slimmer than meeting up with someone within a five km radius. Like a business owner running Adwords, you want to make sure you have the resources to follow up with these leads. There’s no point in swiping right and getting all those matches if you don’t have the time to follow up and turn them into conversions. Better to turn your ads off (or set your Tinder profile to undiscoverable). Remember: quality over quantity. Settings are crucial to creating a well-running Adwords account — the same goes for Tinder! Make use of all the settings that are available to you. Looking for people within a specific age range who are close in proximity might decrease the amount of people available, but the people left will be more qualified! Check out part three of this series covering your profile schedule and optimal hours of the day to swipe!